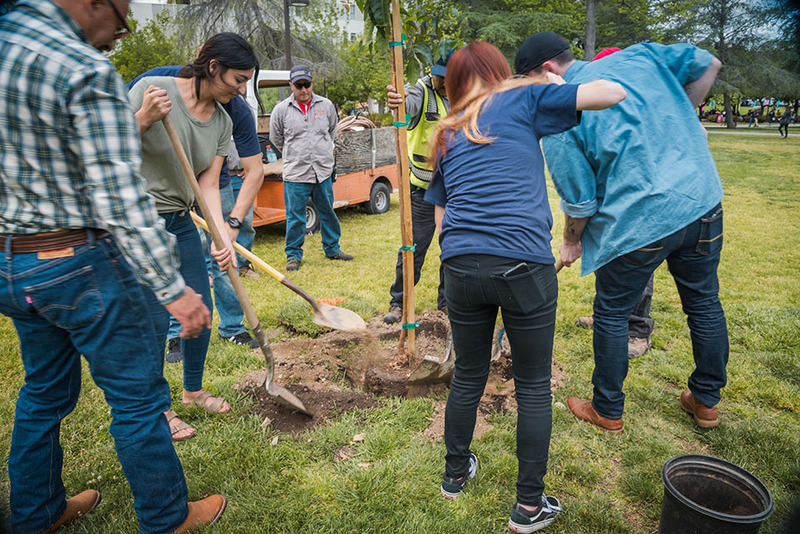 CSUN students and staff plant trees in the Sierra Quad, during the annual Earth Fair in April 2017. California State University, Northridge has earned another stellar ranking from the nation’s largest organization for sustainability in higher education. In November, the Association for the Advancement of Sustainability in Higher Education (AASHE) ranked CSUN among the top 10 for master’s degree-level institutions in its Sustainable Campus Index. The recognition marked the second year in a row AASHE has honored CSUN for its efforts and achievements in sustainability. In 2016, the association awarded CSUN a gold rating in its Sustainability Tracking, Assessment and Rating System (STARS). The gold rating was the highest in the California State University system at that time, and the first year the university had completed the very complex and rigorous STARS application. The new Sustainable Campus Index recognizes top-performing colleges and universities in 17 different categories of sustainability related to academics, engagement, operations and administration. The lists are based on institutions’ STARS ratings. CSUN was one of three CSUs in the top 10, along with Sacramento State and Humboldt State. CSUN scored highly for its curriculum aspects, including the large number of courses that address sustainability issues, as well as the myriad ways students can explore sustainability as interns, in research and with campus-improvement projects. The campus also scored well in the area of campus engagement, including peer-to-peer education and student ambassadors through Associated Students Recycling. In addition to energy efficiency, highlights of campus operations included grounds management such as drought-tolerant landscaping. CSUN distinguished itself from other universities and achieved the gold rating by focusing campuswide on sustainability efforts, campus officials said. The STARS application involved a survey with hundreds of questions that required about six months of data gathering to complete, Eriksson said. About 50 people across campus gathered the required information. The university’s next step is working to reduce greenhouse gas emissions as part of its climate action plan, according to Eriksson. In 2016, President Dianne F. Harrison joined a group of 10 university presidents in signing a pact as part of the American College and University Presidents’ Climate Commitment, working with the nonprofit organization Second Nature. Through this commitment, the presidents pledged to improve their universities’ practices to reduce the emission of harmful greenhouse gases as well as adapting to a constantly changing climate. To read AASHE’s Sustainable Campus Index report or for more information about the rating system, visit the association’s website. To learn more about campus sustainability efforts, visit the CSUN Sustainability website.